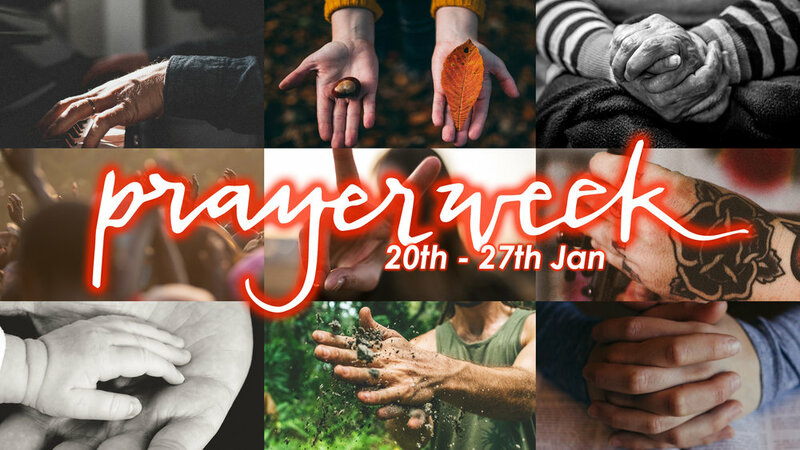 January 2019 Prayer Week 20th-27th. "Devote yourselves to prayer, being watchful and thankful." Paul, in Colossians 4:2. Each January we dedicate a week to prayer and fasting. It's a great opportunity at the beginning of a year, with new possibilities and opportunities, to carve out some extra time to pray - for ourselves, those we care about, our church, our city and our world with its great needs. For some of us this will be easy, for others it may feel a bit intimidating! Our hope is that this week everyone will take a step forward in prayer and find a way to join in. When Jesus’ disciples saw him pray, their response was, "Jesus, teach us how to pray." That's a great prayer for us as we head into prayer week, because our prayers change the world and they change us too as we draw near to Jesus. "Prayer is not overcoming God's reluctance. It is laying hold of His willingness." Martin Luther. Sunday 20th. Our evening service launches Prayer Week where we will spend some time praying together for our church, city and world. 24/7 Prayer Room opens at midnight on Sunday 20th. It's a prepared, interactive space that will help you pray, themed around 'Breakthrough!' Book an hour slot here and you will be sent the details of how to access the room. Monday-Friday, 7.:5-8.:5am Early Morning Prayer in the Foyer. A great way to start the day. Each morning we will be praying for Woodies and we will include a different city focus, too. There will be tea and coffee! Tuesday 22nd 7:45-9:30pm Prayer Watch in the main hall, with a focus on praying for the next generation. Come with your pastorate/small group/on your own for a powerful, interactive evening of prayer and worship. Friday 25th. Late night Worship and Prayer event, 10-12.00pm led by Woodies worship team, main hall. Join us as we welcome the Holy Spirit, worship and pray. 4 Other things to help us pray during the week. 1. Look out for a daily prayer video each morning on facebook/twitter/instagram from one of our different congregations helping you to pray for WGoC around the city. 2. Try using Rob’s A4 Prayer Plan. Available to download here, we'll have hard copies too, to help you pray this week and beyond. 3. Midday Prayer. Wherever you are, set your alarm to go off at Midday and take a moment to pray the Lord's Prayer. 4. Take some time to fast and pray this week. Find our useful guide to fasting here. Come and join us for 'Space' 10pm-midnight in The Main Hall at Woodlands Church. It's an opportunity to join in with our PrayerWeek in 'our extension of the PrayerRoom' where we will be praying and listening to God all whilst being in an atmosphere of worship!